Topics: Lessons, Pricing, Road Safety, Instructors, Theory Test, and Highway Code. 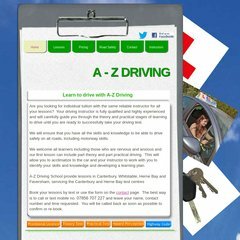 A-zdriving.co.uk's IP address is 213.171.218.119. Its 2 nameservers are ns2.streamlinedns.co.uk, and ns1.streamlinedns.co.uk.